The extended trot requires your horse to lengthen his frame and stride while increasing the suspension between footfalls. In other words, his hooves stay off the ground longer than they do during a working or collected trot. Increased speed is an incidental result of trot extensions rather than a goal. If you simply ask your horse to pick up his pace, he will not extend automatically. Even though the extended trot is faster, the pace of his footfalls does not increase. Use a saddle with a deep, comfortable seat when practicing the extended trot. Lengthen the stirrups one or two holes if necessary or consider working without stirrups so your legs can stretch farther along the horse's barrel. You can sit or post the extended trot. 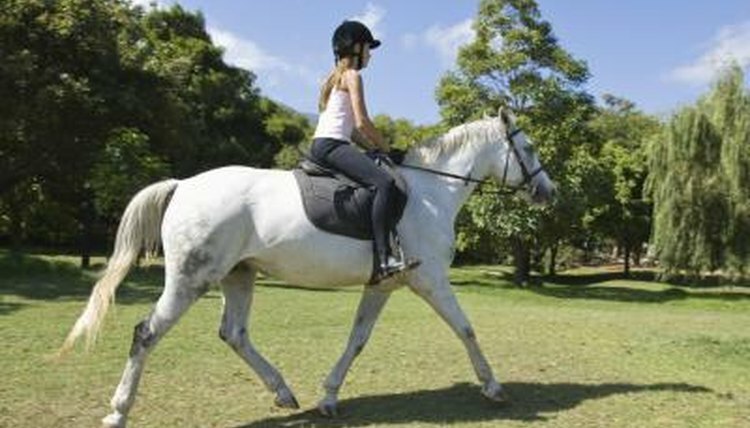 Sitting the trot will allow you to give more accurate cues through your seat and upper legs, but many horses become uncomfortable during trot extensions. The greater action through your mount's legs will make the gait bouncier. However, posting the extended trot sometimes encourages speed rather than lengthening of the stride, so it is important to experiment with different positions to see which works best for you and your horse. Transition into the extended trot from the collected trot. Wait until your horse is using his hind end and reaching underneath himself with his hind legs. Apply pressure with both calves at the girth while softening the reins to send him forward. Maintain contact with his mouth so he sustains impulsion in the extended trot, but allow him to lengthen his frame. If he quickens his pace or attempts to run out, bring him back to a collected trot and try again. When a horse exhibits problems with maintaining collection, perform several downward transitions to reinforce your desire to keep him in frame. Perform the extended trot for short periods of time, starting with 10 or 12 strides at first. Trot extensions are difficult for the horse to maintain because they require significant top line and hindquarter strength. Use the long side or the diagonal of an arena, for example, then bring the horse back to the working or collected trot. Sit deep in the saddle so you do not bounce against his back, and keep your hands steady so they do not bump the bit. During training, maintain leg pressure to provide support until you are ready to transition down to a collected trot. Keep your knees and thighs open, so you do not inhibit your horse's shoulder movement. Use cavaletti or trot poles to help your horse lengthen his stride. Position five poles in a straight line about 4 feet apart. Trot down the line several times at a working trot, then slowly increase the distance between the poles until they are five feet apart. If your horse kicks any of the poles or attempts to run out of the line, reduce the distance and start again. Always ask for the extended trot before you reach the cavalettis so your horse knows to respond to your cue rather than to presence of the poles.